Borno State Governor, Alhaji Kashim Shettima, on Wednesday dismissed the book former President Goodluck Jonathan launched on Tuesday as an “elementary book of fictions,” that lacks courage. He said the book, 'My Transition Hours,' by the former president was a clever attempt to sweep incontrovertible facts on the abduction of Chibok schoolgirls under the carpet. He also tongue-lashed the former president, who in the book among other allegations, says Shettima and the rest of the All Progressives Congress conspired in the kidnapping of the Chibok schoolgirls. Shettima, who said he read through the book Tuesday's night, argued that Jonathan's claim on page 31 that Boko Haram wanted a Muslim president was laughable because the insurgents actually began their deadliest attacks in Borno under the regime of the late President Umaru Musa Yar'Adua, a Muslim from northern Nigeria. He said the former president deliberately omitted in chapter four of his book, an investigative report submitted to him in June 2014 by the presidential facts-finding committee he constituted in May 2014, which was mandated to gather evidence-based facts and circumstances on the abduction. Shettima, also in his reaction to the book, contained in a statement by his spokesman, Mallam Isa Gusau, criticised the allegations contained in chapter four titled 'The Chibok Schoolgirls Affair”, adding that Jonathan was wrong to have indicated that the schoolgirls' abduction was a product of conspiracy by the then opposition All Progressives Congress and the Borno State Government. He said that contrary to the claim by the former President that the Borno State Government and a former United States President Barack Obama undermined efforts to rescue the Chibok girls in 2014, the truth is that Jonathan never believed there was ever an abduction until rescue efforts were late. “The former President's elementary book of tales fell short of the courage required of him to publish findings by his own panel in chapter four of his book. “The whole of Tuesday night, I took the pains of reading His Excellency, former President Goodluck Jonathan's book, 'My Transition Hours,' from the first to the 177th page. I took particular interest in chapter four (the Chibok schoolgirls affair) which has 42 paragraphs written from pages 27 to 36. I was amused that despite admitting in paragraph 15 that he had (in May 2014) constituted a Presidential Fact-Finding Committee under Brigadier-General Ibrahim Sabo and many others “to investigate” the Chibok abduction, former President Jonathan refused to mention any part or whole of the findings by that panel which had submitted a highly investigative report to him on Friday, June 20, 2014, after the panel held investigative meetings with the then Chiefs of Defence Staff; Army Staff; Air Staff; the Director-General, Department of State Services and Inspector General of Police, met all security heads in Borno, visited Chibok, met with parents of abducted schoolgirls, met surviving students, interrogated officials of the school and the supervising ministry of education, interrogated officials of West African Examinations Council and analysed all correspondences. “What has become very clear is that the former President decided to sit on facts in his custody while he published, in an elementary standard, a book of fictions designed to pass guilty verdicts to anyone but himself, with respect to the open failures of his administration to rescue our daughters and in tackling the Boko Haram challenges,” Shettima was quoted by his spokesman. Shettima said, “For the records, on Tuesday, the 6th of May, 2014, President Jonathan had inaugurated multi-agency/stakeholder fact-finding panel under the chairmanship of Brig.-General Ibrahim Sabo (retd), a one-time director of military intelligence and also appointed a secretary from the Niger Delta. President Jonathan single-handedly selected all members of that committee which included his trustees amongst serving and retired security officers from the army, DSS and police; representatives of the United Nations and Economic Community of West African states, representatives of the Chibok community, local and international civil rights organisations, representatives of the National Council on Women Societies, the Nigeria Union of Journalists, among other persons he trusted. “For almost two months, the probe panel undertook forensic assessment of all documents on the entire issues, held investigative meetings with parents of the schoolgirls during a visit to Chibok. The panel held separate one-on-one investigative meetings with myself, the then Chief of Defence Staff, Chief of Army Staff, Chiefs of Air and Naval Staff, met the then Director General of the DSS and the Inspector General of Police, all of whom were appointees of President Jonathan. “The panel interrogated officials of Borno State Government including the Commissioner of Education and the school principal. The panel also held investigative meetings with heads of all security agencies in Borno State including security formations in charge of Chibok. At the end, the panel submitted its report directly to President Jonathan on Friday, the 20th of June, 2014 in Abuja. President Jonathan has refused to make public the findings submitted to him. I was expecting the findings in his book but he has deliberately swept that report under the carpet. The governor advised Jonathan to write a second book on account of his presidency which should contain the facts as have been presented to him, regarding the Chibok abduction rather than the fiction he made public on Tuesday. 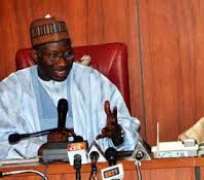 The Arewa Consultative Forum and the Northern Elders' Forum on Wednesday defended their opposition to ex-President Goodluck Jonathan when he contested the 2011 and the 2015 presidential elections. He added that the forum expected the former President to respect the zoning formula shortly after the death of the late President Umaru Yar'Adua but regrettably, Jonathan and his party reneged on the zoning agreement. The former Ahmadu Bello University vice-chancellor, stated, “Yes, it is true that Northern Elders' Forum worked against Jonathan and we told him why. The National Publicity Secretary of the ACF, Alhaji Muhammad Ibrahim-Biu, told one of our correspondents that the former President's assertion that the North worked against him was odd, considering the “circumstances at that time.” The spokesman admonished Nigerian leaders to always honour agreements they entered into. The former President, in his new book, 'My Transition Hour' had said that he battled opposition from Northern leaders and socio-political groups, which felt he was usurping power from the region. Jonathan said the northern power blocs had tried to deny him his constitutional right of contesting the 2010 presidential election after the death of President Umaru Yar'Adua in 2010. Tambuwal, who spoke through his Director-General, Media and Publicity, Abubakar Shekara, was reacting to Jonathan's claim in his new book. The governor denied that blind ambition led him to defect from the PDP to the All Progressive Congress, ahead of the 2015 general election. In an interview with The PUNCH, Shekara said the circumstances that led Tambuwal and others to defect were clear to all. He said, “Tambuwal and others who defected from the PDP to the APC were just responding to the wishes of the people. Jonathan in his new book says some PDP governors worked against his re-election in 2015. He also stated that Tambuwal, who was a PDP member and Speaker of the House of Representatives in 2015, chose to hobnob with the opposition.